It was my 20th birthday yesterday!! and I've been celebrating it since Wednesday with friends, the boy, and family [all on different nights], plus I have another family party to go to tonight during which there will be cake. I love cake! Anyway, I've had on one coat of Wet N Wild Ebony Hates Chris, one coat of Cult Nails Clairvoyant, & one coat of Lynnderella Bride of Franken on since Wednesday afternoon, so it was wayyyyyyyyyy too beat up to show you guys. Don't worry, I'll DEFINITELY be doing that combo again soon, so it'll be up here:] So instead of my birthday mani, you get to see my runner up: Kendall on the Katwalk. 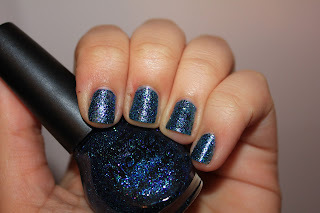 This was absolutely my favorite of the Kardashian "Kolors" [hate that freaking K they put in everythinggggggggggg]. 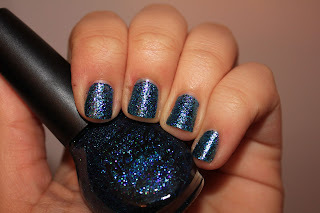 Blue + green + purple + GLITTER?! Instant love. What did you ladies think of KotK? Or the collection in general?? I'm not a huge fan of the Kardashian's, but the colors in their collection are pretty awesome! I haven't been able to get my hands on any of them, but Kendall on the Katwalk is my favorite. Happy belated birthday to you! Happy Belated BIRTHDAY!!! I would sing, but we would all die, lol. Happy birthday! :) I can't really remember my twentieth birthday ... which means it was pretty good! Have a lovely birthday weekend. Happy belated Birthday! Oh my, to be 20 again! I love the NOPI too! Happy Belated Birthday Luvey! Hope your day was fabulous! And I am loving the K collection! Happy birthday, darling! And I'm totally with you on the K thing...makes me bonkers. But this color looks beautiful on you! Happy b day this color is super pretty I didnt get any of these polishes my Walmart was cleaned out! I really like this, but the fact that it is associated with the Kardashians is what is keeping me from buying it. It looks gorgeous on you though! Happy birthday! Making me feel old! I'm to be 44! &@Rach, I don't remember much of it either haha. Success! @Katherine, I know, it was hard for me to pick this up. I just took off that weird little tag thing and pretended it's not a Kardashian polish.